The magnetic field that protects Earth from deadly cosmic radiation may be more vulnerable than previously thought. 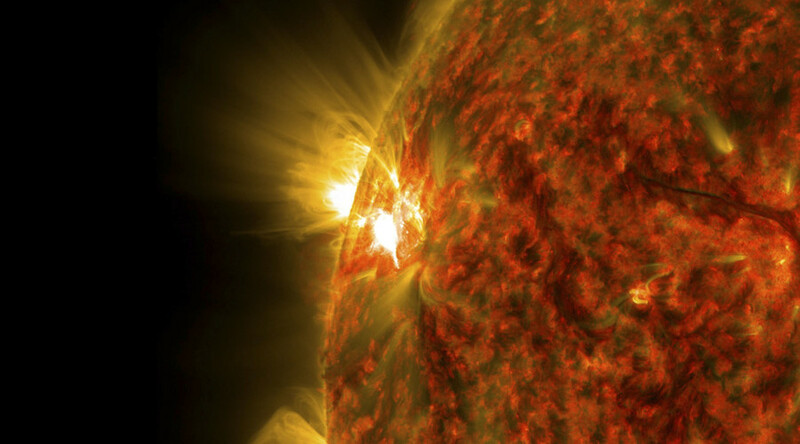 A crack in the shield caused by a solar flare which exposed the planet to a bombardment of radiation has been detected. Researchers from the Tata Institute of Fundamental Research in India made the discovery when analyzing a galactic cosmic ray burst that caused radio blackouts across North and South America and a supercharged aurora borealis in 2015. The cosmic ray source was a giant solar plasma cloud that travelled 40 hours from our sun to reach Earth, where the researchers believe it caused a transient “weakening of Earth’s magnetic shield”, according to their findings published in the journal Physical Review Letters. The sun’s flare was so intense the team claim it would have shrunk the magnetic field from 11 times the radius of Earth to four times its radius before it eased, allowing the shield to recover. Researchers used data from the GRAPES-3 muon telescope in Ooty, India, to simulate the burst. Results indicated the effect on Earth would have required a crack in the magnetic field that lasted approximately two hours. Unfortunately not a lot can be done to protect Earth from any future cracks in the shield, which could leave the planet under constant exposure to radiation and could potentially lead to the eradication of our atmosphere. Astronauts onboard the International Space Station (ISS) fall within the field’s 56,000km extension around Earth but future voyagers to Mars would likely be exposed to the rays for long periods.